Susie Raney was a sassy young high school student when she cut William Bell’s own superb deep wailer You Hurt So Good, later covered with such distinction by Mitty Collier. Only a few copies of the 45 were ever pressed up and Susie never followed the 45 through with any other sessions. But it remains a cult single – not bad for a disc that was virtually a vanity recording, cut as a favour by Bell at the request of Atlanta’s chief promoter and artist management entrepreneur Henry Wynn. Raney was a friend of Wynn’s daughter and he featured her on one of his Supersonic package tours but she never made music her career. 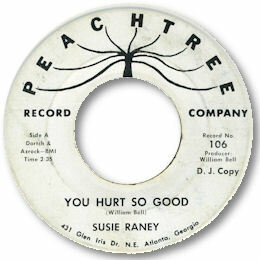 Note ~ "You Hurt So Good" can be found on the Grapevine 2000 CD "Atlanta Soul".